Smashing guitars into pieces, crowd surfing and concocting hypnotic light displays are not addressed in J. Ring's curriculum. 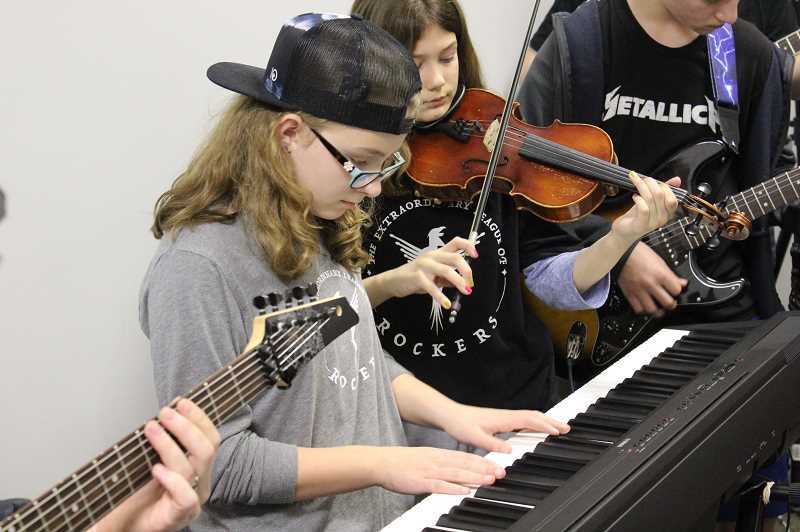 But through the Wilsonville-based Concert School of Music's eXtraordinary League of Rockers program — which is directed by Ring — young musicians learn the nuances of live performance and get a chance to rock out in front of a sizable audience. "It's to get kids an experience as a professional musician, give them the rock star treatment I like to think — just to show them what it's like to really experience live venues and performing for people, getting over their stage fright, overcoming odds," King said. The program, which is in its fourth year and features three bands this year, includes three live performances, culminating in a Battle of the Bands showcase Saturday, Dec. 15 at Mississippi Studios in Portland. The three bands will perform a handful of songs and then three judges will vote on the winner. The Concert School of Music is a music instruction studio located in Wilsonville Town Center. For more information, visit www.concertschool.com/xlr. From jazz combos to southern rock groups, Ring has been a part of many bands through the years. And he said there is a stark difference between performing in your basement and in front of a packed audience. "It's a completely different dynamic," he said. "You have a lot more pressure on you, a lot more eyes looking at you and people are expecting some sort of experience whenever you're playing in front of them. We try to teach people how to give experience and express themselves to people to create an environment and ambiance that draws people in." Some tips Ring imparts include smiling and showing lively facial expressions, moving your feet back and forth as you perform and improvising. The latter, he said, is particularly challenging to master. Some improvisations include singing the chorus twice, prolonging the bridge, stopping for a second at a climactic moment and diving into a spontaneous guitar solo. "You have to read the audience. You have to figure out 'Did they respond to that?' really finding the magic moments in the song," Ring said. "This is the exact moment in the song that can really draw the audience in and knowing that ahead of time and then knowing what to do with that." Ring said the program used to hold shows at McMenamins Old Church and Pub in Wilsonville but drew too big of a crowd so they had to switch venues. Last year, he said the final performance included over 100 attendees, creating an atmosphere that can be nerve-racking for inexperienced performers. "I'll be nervous but not a crazy nervous," Wilsonville resident and Sherwood High student Jaxson Roberts said. "I know if I mess up I have my band behind me and the audience is sometimes parents so I'll see my mom and I'll think 'It's fine if I mess up because my mom is there and she will be cheering on for me.'" This year's bands include Imaginary Dragons, which plays Imagine Dragons songs; Zero South, which plays mostly classic rock; and Diego, which plays pop rock and other styles. Roberts is finishing up his second year in the program and is the lead singer and guitarist in Zero South. In his first performances, he tried to engage the crowd by telling jokes between songs. However, by the end, he ran out of jokes. For the upcoming show, he's thinking of ways to alter his transitional fodder. "I'm gonna try to put more thought into the transitions, try to have something to say during that. I also want to have more stage presence and focus on being super powerful on stage and also sounding really good and working on my singing," he said. Wilsonville resident Carter Schnell said he had "terrible" stage fright prior to joining the program. But after five shows in the last two years, he's gotten over that. "Just be confident and make sure you tune your guitar before you start playing. Don't worry about what other people are going to think about what you're doing," Schnell said. "It's not nearly as bad as what you think. Just enjoy it." 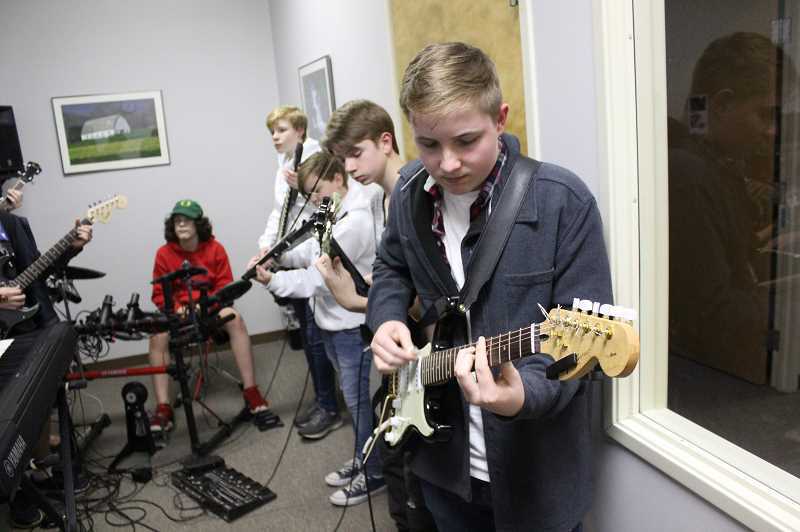 Aiden Paulson, a guitarist who is finishing up his first year in the program, is excited to perform his first live solo at the upcoming show. And on top of that, he gets to strum the blistering power chords of his favorite band, Metallica. "He's (Metallica guitarist Kirk Hammett) really, really good so I've just been practicing a lot to be good like him," Paulson said. And Roberts, for his part, would love to emulate Green Day singer Billy Joe Armstrong and Queen singer Freddie Mercury. "He had amazing stage presence and he's really flamboyant," Roberts said of Mercury. "I want a part of that." Schnell's group won the Battle of the Bands last year and he is playing rhythm guitar for Zero South this year. He relishes being a part of the band. "When it comes down to it, you're just having a great time with your friends," he said. "That's all it is." Ring would love to help the bands get to the point where they are good enough to book professional shows and also hopes the program grows enough so that as many as 10 bands are competing in future years. "I really believe if these kids have a transformative experience, that's going to show," Ring said. "They're going to tell their friends. I've already seen it happening. We've already seen more people come in because of that." Paulson, who strives to be a professional musician one day, says nothing compares to the rush he felt when strumming his heart out in front of an audience. "It's so awesome to be up there," he said. "I just like the feeling of it."